puerto Limon, commonly known as Limon boasts pristine beaches, a wide range of dazzling Caribbean building and sprawling banana plantations and dense rainforest, makes this a zesty slice of heaven. Enjoy a fantastic journey down the canals and natural rivers enabling you to appreciate the lush flora and fauna of the Caribbean. Take a leisurely unforgettable tram tour at Rainforest Adventures, Costa Rica and observe wildlife through the treetops of the rainforest. Ride aboard the historic railroad passing lush tropical forests and farms to the banana plantation where you will learn about this amazing fruit and its importance to Costa Rica. Offering visitor's a unique introduction to sloths and their natural history. You will also meet and be able to photograph sloth's on this once in a life time experience. 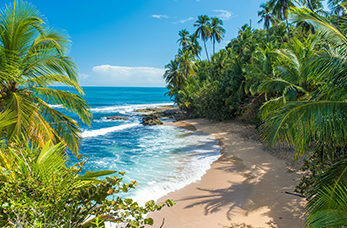 Enjoy a tour which offers an introduction to the world of banana's along with coffee plants, field of sugar canes and trees ripe with cacao and macadamias. Enjoy a day of discovery and adventure at this research centre and park. Visit a butterfly garden, a reptile habitat and a hummingbird garden. You can also ride a canopy tram and hike the trails.